And here I am again with submission #5! I am having a lot of fun with these challenges today. I hope to get some feedback when all is said and done because this is quite an amazing amount of crafting I am doing today! But, I planned on it and am really enjoying myself. It's perfect timing too, because my hubby is working out of town this week and so I can hang out in my craftroom without feeling too guilty. This one is for Teacher Appreciation Days. 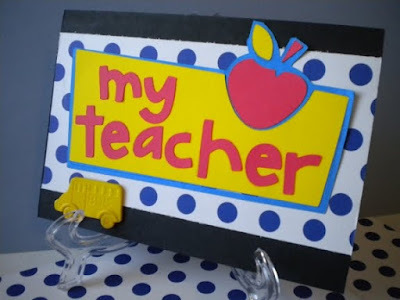 I am not sure if my son would be comfortable giving a favorite teacher a card next week since he is now in Middle School, but it was fun making it anyway. I opted for a very simple card style, so it could be given to a male or female. I used the Locker Talk Cricut Cartridge. This is also a cart I haven't used very much. It was a little tricky to layer because it wanted to fall apart and the backing was a bit fragile...but with enough adhesive and zig glue, the world can be mended. I added a little school bus embellishment I found in the fabric department of Walmart. It wasn't for papercrafting, but I thought it was cute! My sister is a hard working teacher! Great card! MPS NSD Challenge # 11- "Colors of the Rainbow"
MPS NSD Challenge #6 - "Kids CraftToo"
NSD Challenge #8 - "Love My Color"
National Scrapbook Day Challenge #7 - "Hey Dad!"